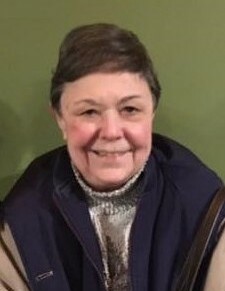 Obituary for Joyce M. (Graf) Gruzosky | Edder Funeral Home, Inc.
Joyce M. (Graf) Gruzosky, 76, of Rochester, NY, died Wednesday, January 16, 2019 at Rochester General Hospital. She was born January 23, 1942 in San Mateo, CA, the only child of the late Earl J. and Madeleine (Moreno) Graf. Joyce was raised and educated in the San Francisco area of California, graduating from Notre Dame Belmont High School in 1959. She attended the University of California at Davis where she studied Political Science and minored in Psychology. In 1966, she graduated from Stanford University as a Radiological Technician. Following her marriage to Richard "Pook" Gruzosky in 1967, she and her husband moved to Rochester, NY where she was employed for several years at Urology Associates. Joyce was a long time member of the Holy Ghost Catholic Church in Rochester. She enjoyed gardening, reading and visiting her family in San Francisco, CA and Girard, PA. In addition to her parents she was preceded in death by her husband, Richard A. "Pook" Gruzosky on May 7, 2010, by her daughter, Jennifer Anne Gruzosky on January 14, 2005, a brother-in-law, John Gruzosky, Sr. and a sister and brother-in-law, Jean and Howard Sabovik. Survivors include a sister-in-law, Patricia Redding of Lake City, PA, an aunt, Dorothy Graf, of San Francisco, CA, Joyce's fat cat, "Big Guy" and several nieces, nephews, great nieces, great nephews and cousins. Friends may call at the Edder Funeral Home Inc., 309 Main St. East, Girard on Friday from 11:00 a.m. to the time of a Prayer Service at 12:30 p.m. followed by the Funeral Mass at St. John the Evangelist Catholic Church, 101 Olin Avenue, Girard at 1 p.m. with Fr. Scott Detisch officiating. In lieu of flowers, memorials may be made to the Pluta Cancer Center, 125 Red Creek Dr., #101, Rochester, NY 14623. Burial will be in St. John Cemetery.